In a city as large as Atlanta, Georgia choosing a place to dine is like being on a weight-loss plan and trying to fill your plate with only your favorite dishes on Thanksgiving. 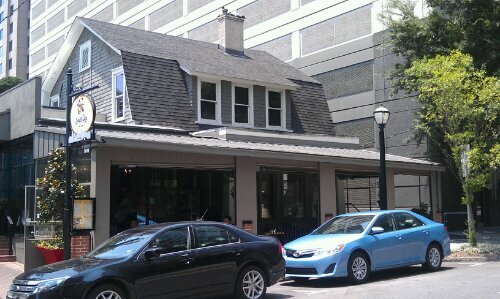 That was the situation last Saturday as we drove around the A-T-L in search of the perfect brunch spot. It was South City Kitchen that won me over–the lively patio full of happy customers drew me in and as soon as I laid eyes on the menu, I knew we’d made the right choice. 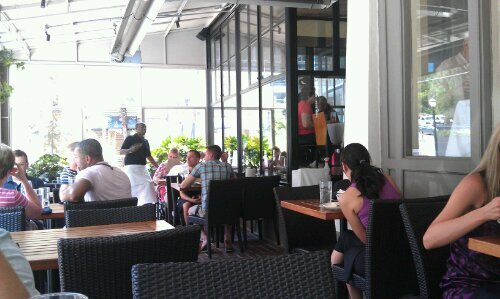 We were greeted politely, then led through the cool, sophisticated dining room out onto the more relaxed patio. We took a seat in the wicker chairs and soon after, our well-dressed waiter delivered a bread basket and poured us up a cold glass of purified water. 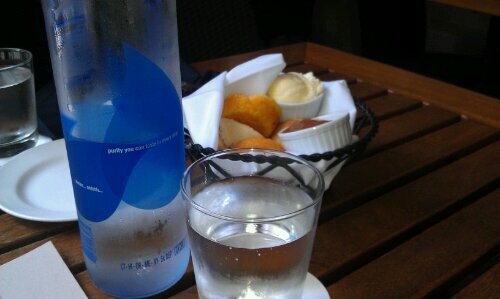 It’s the little details that really take a dining experience up a notch, like watching your server pour water into a clean drinking glass while sitting outside in the June humidity. 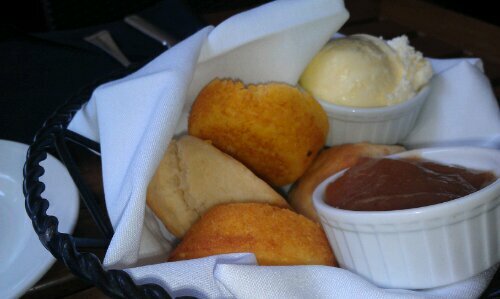 Filled with warm, soft biscuits and golden corn muffins, the basket also sported softened butter and cold apple butter for spreading. One bite of that biscuit and it was circa 1991 and I was in my Grandma’s kitchen without a care in the world. 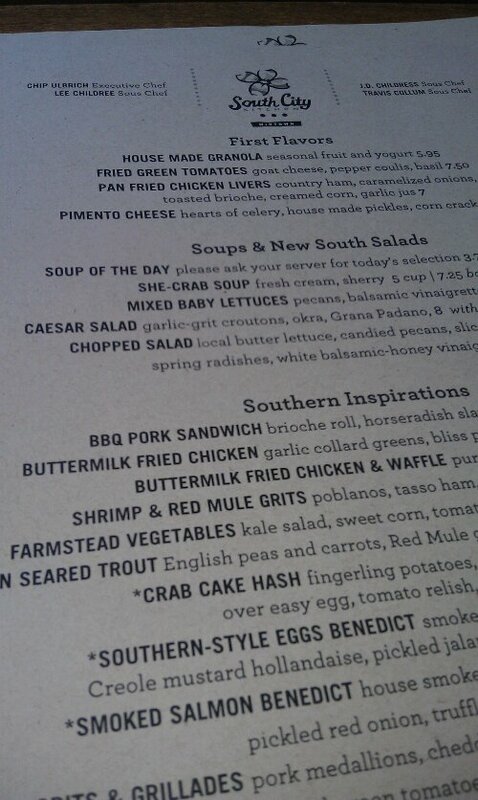 On the menu, you’ll find many southern classics like Buttermilk Fried Chicken, BBQ Pork Sandwiches, She-Crab Soup and Grits & Grillades. Unpredictable side options like corn and tomato, kale salad and fingerlings are a nice surprise. The prices ranged anywhere from $5.95 for their House Made Granola to $19 for the Shrimp & Red Mule Grits- stone ground from Athens, Georgia. The atmosphere is settling like a slower pace from a previous time. As a customer, you get the feeling you’re a respected guest. The restaurant’s most popular menu item is the Buttermilk Fried Chicken. Shrimp & Red Mule Grits takes second place. I decided on the Buttermilk Fried Chicken and Waffle with pure maple syrup for $17. I must admit, I’ve always been curious of the combination. Crazy as it seems, it works. The crunchy fried chicken with the buttery waffle…now I know why it’s a Snoop Dogg favorite. Right on Snoop Doggy Dog! 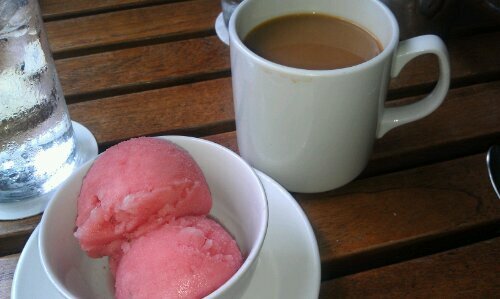 We finished the meal with a sweet and fruity Watermelon Sorbet, available by one scoop or two, with coffee. Finding parking was the only challenge to eating here, but after the chicken & waffle dish, it sure didn’t hurt me to walk a few blocks. 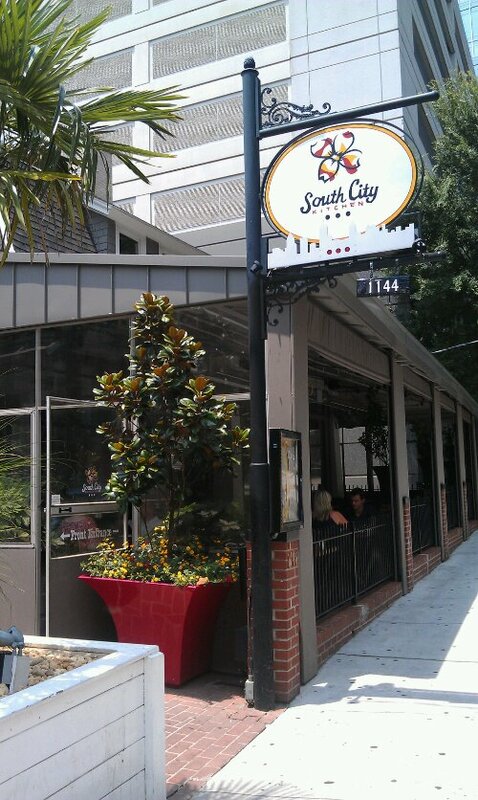 Open since 1993, South City Kitchen lives up to its motto…dining the way the South intended. Another great review. Based upon your blog we dined here this past Saturday. Sunday we went to Optimist and you were right about them, too. Jon, that is great news!! How awesome! Ha. Visitors like you make posts like this so worth it. Man, isn’t their food amazing? I loved the whole experience. Thank for the shout out. I really appreciate it! You have a great blog, by the way.